Documentation from Phillip Zarrilli and Deborah Neff's 1986-1989 fieldwork regarding New Glarus, Wisconsin and its Swiss summer festivals, plus materials from Ric Segovia's 1999-2000 research on the same topic, including interview transcripts, Ric Segovia's essay on the Wilhelm Tell play, and Wilhelm Tell play programs. 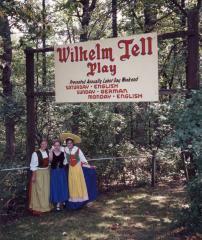 Ushers for the Wilhelm Tell play pose under a sign advertising the play, 1999 September 4. Photograph by Ric Segovia, courtesy of the UW-Madison Archives, #S09878.